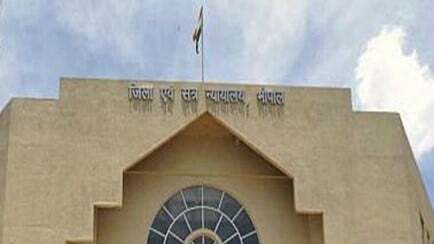 The statue was not only removed from the Bhopal District Bar Association’s office, but also windows, gates of the auditorium were broken by unidentified persons on Sunday night. Bhopal: A statue of Bharat Ratna and father of Indian Constitution late Dr Bhimrao Ambedkar installed in the premises of a Bhopal court was reportedly desecrated and removed by some unidentified assailants on Sunday night. The incident took place a day after the district court judge Rajendra Verma objected to the installation of the statue in the court’s premises. The Bhopal District Bar Association has lodged a complaint regarding the incident at the MP Nagar police station. “The assailants not only removed BR Ambedkar’s statue, but also smashed auditorium’s CCTV cameras, chairs, windows, etc. We have reported the matter to the MP Nagar police, and have given the CCTV footage of the incident,” said president of the District Bar Association, Rajesh Vyas. The Bhopal District Bar Association had installed on Friday a statue of Dr Ambedkar at the Bar Association Auditorium – which is already named after him – and had planned to unveil it on Saturday. Hours before unveiling, Vyas and association’s General Secretary PC Kothari were reportedly summoned by the Bhopal District Judge Rajendra Kumar Verma. The judge asked the association to remove the statue, as it was constructed without permission from the Madhya Pradesh High Court, and handed a copy of order to them. “We urged the court to remove the statue on its own. We had no problem, but the association will not remove it because lawyers want the statue here,” Vyas. Vyas, who was elected as the president of the association for the fourth time, says that he had promised the lawyers during the election that he would install Ambedkar’s small statue at the Bar Association’s auditorium as token of respect for Ambedkar. “After election this time, I named the auditorium after BR Ambedkar, and planned to install a statue in it. So, on the evening of December 21 (Friday), a statue of Ambedkar was installed at Bar Association’s office. It was scheduled to be unveiled on December 22, 2018. However, district judge asked us to remove it,” said Vyas. After Verma’s order, the Bar Association planned to knock on the Madhya Pradesh High Court’s door to seek permission for installation. But the statue was not only removed from the Bhopal District Bar Association’s office, but also windows, gates of the auditorium were broken by unidentified persons on Sunday night. “The unidentified men tried to smash every CCTV camera installed inside the auditorium to keep themselves untraceable, but they failed, and a camera captured the entire episode. The footage was given to the police,” Vyas said. As the controversy erupted, heavy police force was deployed in the court premises to avoid untoward incident. “If, the administration wanted to remove the statue quietly at night, they should have informed the Bar Association,” he added. Senior advocate and executive member of Bhopal District Bar Association Ambika Soni feels that the caste issue has played a major role in this controversy. “A group of upper caste lawyers disagreed with this move. When they failed to convince the association to not install the statue, they complained to the district judge,” she alleged. The Newsclick tried contacting the District Judge Rajendra Kumar Verma, but his phone was unreachable.